UCOG Today [Paul Kieffer] » Blog Archive » "See ya later alligator"
Maybe "From a distance" might be a better song title for this post rather than 1956 hit by Bill Haley and his Comets. At the end – or actually through the end portion – of our property in Mobile there is a dead-end creek. It was dug years ago by one of Monica’s relatives to connect up the property here to a nearby canal that empties into Mobile’s Dog River, which leads to Mobile Bay. That gives us (if we wanted it) access to Mobile Bay. But we are not really into boating. We not only have access to Mobile Bay – water creatures also have direct access to our property, like this ten foot alligator that dropped by several days this month (it is right in the middle of the picture). 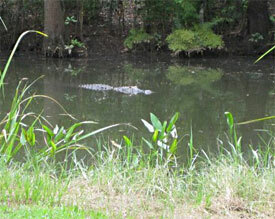 We have seen alligators in the creek (as we call it) before, but none have been this big. It came into the creek in the morning, found a shady spot and then left in the late afternoon. Sorry if the image of the alligator is not larger, but we preferred to view it "from a distance!"